In The Israeli-Palestinian Conflict, Even Calm Is Deadly : Parallels NPR examined more than a decade of data detailing Israeli and Palestinian fatalities. From February 2005 to September 2015, there were only four months with no deaths from conflict-related violence. Mourners carry the body of Palestinian Laith al-Khaldi during his funeral procession at the Jalazoun refugee camp, near the West Bank city of Ramallah, on Aug. 1, 2015. An Israeli soldier shot Khaldi after he had been throwing rocks at a military post. This was during a relatively calm period, although almost two dozen Palestinians were killed during the first half of the year. The Israeli-Palestinian conflict is relatively quiet right now. After several months of attacks and killings that started last October, Israeli officials say that wave of violence has tapered off. If this trend stays on track, it could mark yet another time that intense, headline-grabbing violence has surged, then waned, in this decades-long conflict. In other words, it looks like things are returning to a period of relative calm with no war or uprising. But a close look at those so-called calm periods over time shows the killing rarely ever stops. Here's a fact that reveals the persistence of this fight: In the 128 months from February 2005 through September 2015 — almost 11 years — only four months saw no one killed in conflict-related violence. NPR has examined more than a decade of data detailing Israeli fatalities — tracked by Israel's Foreign Ministry and its internal intelligence agency, the Shin Bet — and Palestinian fatalities tallied by OCHA, a United Nations agency charged with monitoring the conflict. Those numbers represent a dynamic that keeps the conflict going — sometimes blowing up into spikes of violence that get much more attention internationally. There are calls for revenge and, perhaps as important in driving the conflict, a degree of acceptance of killings as simply part of life. The murder of Israeli Eli Wasserman is typical of a death during relative calm. It's the kind of killing that people outside the region don't often hear about. Wasserman worked as a security guard at an Israeli industrial zone in the West Bank. On April 25, 2008, a Palestinian gunman killed the father of two as he started his shift. It was his wife, Chaya Wasserman's, 52nd birthday. She remembers going to bed alone that night. "I was kind of crazed, and started crying and screaming, 'What kind of present did you give me for my birthday?'" she recalls. To identify periods of relative calm, we began with Feb. 8, 2005. 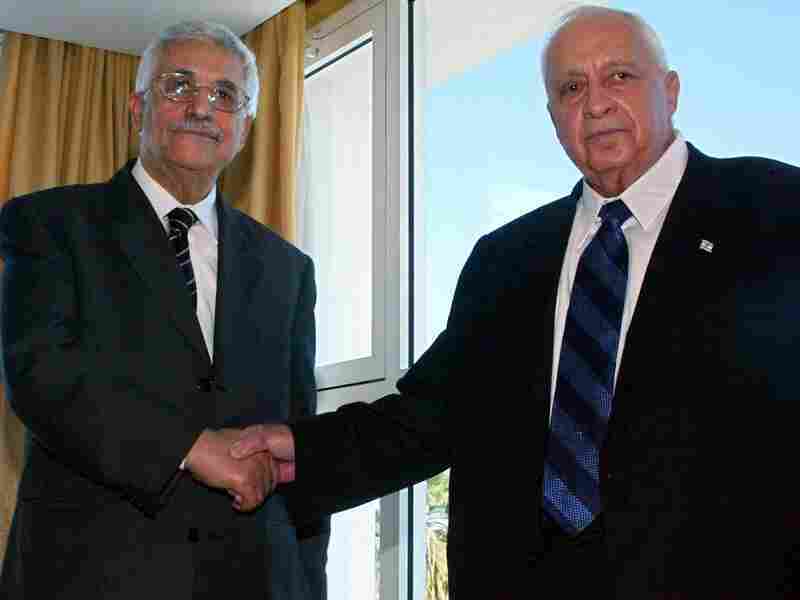 That's when, at a summit in Sharm el-Sheik, Egypt, then-Israeli Prime Minister Ariel Sharon and Palestinian Authority President Mahmoud Abbas (who is still in office) mutually pledged to stop violence after several years of the bloody second intifada, or uprising, against Israel. The violence did not end as pledged. There has been, however, no uprising on the scale of an intifada, and there have been long periods of relative calm between three wars since then. Filtering out those military operations — which took place in 2008-2009, 2012 and 2014 — we stopped counting at the end of September 2015, right before the most recent wave of violence began in October. Excluding wars, from early 2005 through September 2015, Israeli figures show Palestinians killed about 175 Israelis and a dozen non-Israelis, including U.S. visitors and Asian laborers. 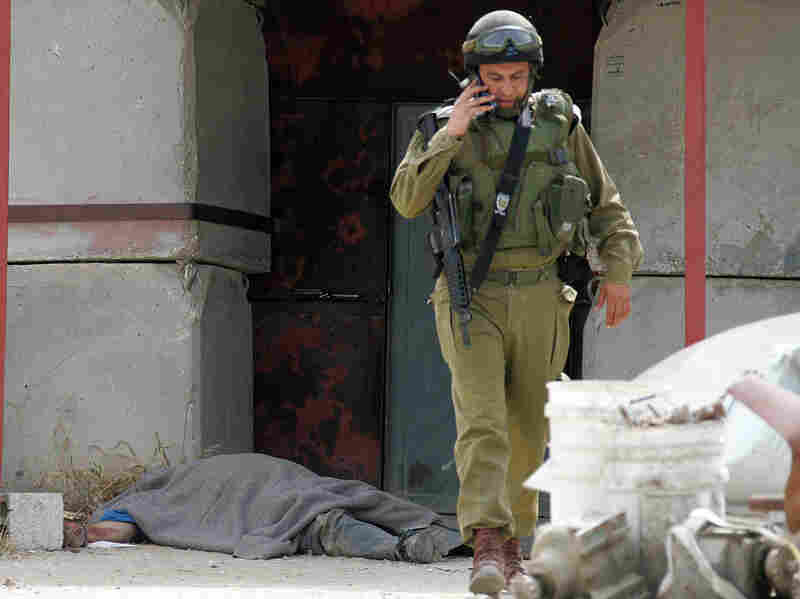 An Israeli soldier walks in front of the body of one of two guards who army sources said were killed by Palestinian militants on April 25, 2008. One of those killed was Eli Wasserman, 51. Israelis killed 2,217 Palestinians during the same period, according to U.N. figures. Palestinian teenager Laith al-Khaldi was one of them. As with Wasserman, his death shows how violence can flare even during times of relative calm. Last July, an Israeli soldier shot Khaldi after he had been throwing rocks at a military post. Although it was a relatively calm period, almost two dozen Palestinians and three Israelis had already been killed in separate incidents in a range of confrontations during the first half of the year. The night before Khaldi went out throwing rocks, Israeli settlers had set fire to a Palestinian home in the West Bank village, killing a baby immediately, badly burning another child and fatally wounding both parents. Khaldi's mother, Samira, says this outraged her son. "He told us, 'Mama, why did they burn the whole family?' And he put the picture of the baby on his profile on Facebook. And he write over it, 'God can help us,' " she says. 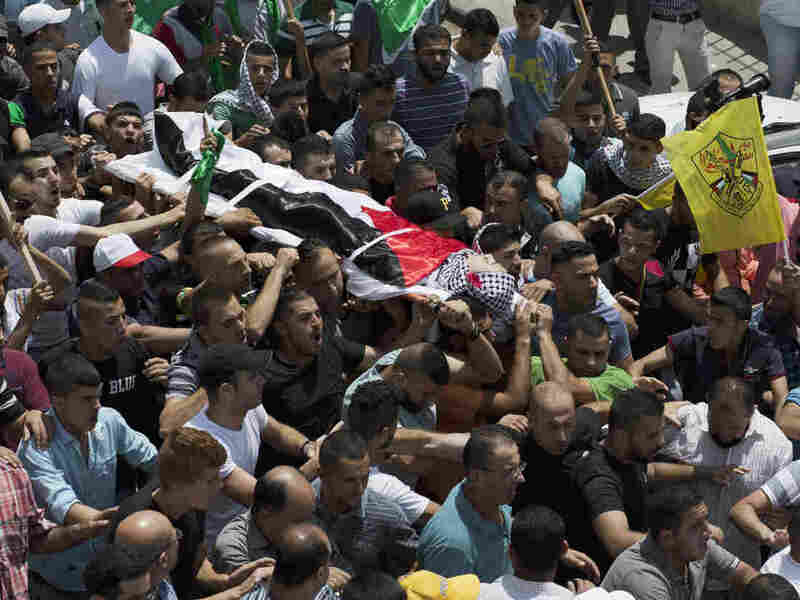 A Palestinian autopsy found the bullet went the teen's back and out his stomach. The Israeli military says Palestinians threw firebombs as well as rocks. Six Palestinians, including Khaldi and the baby burned in the fire, died due to the ongoing conflict between the two sides during July 2015, the month Khaldi was shot. No Israelis were killed that month. This is a tiny fraction of the number killed one year before, in July 2014, when Israel was at war with Hamas, the militant Islamist group that runs the Gaza Strip. In that month alone, 74 Israelis were killed, according to the Israeli government, and approximately 2,250 Palestinians were killed, according to the U.N.
Palestinian leader Mahmoud Abbas (left) and Israeli Prime Minister Ariel Sharon shake hands before their summit meeting in Sharm El-Sheikh, Egypt, on Feb. 8, 2005. Abbas and Sharon declared a cease-fire to end four years of deadly violence. Since then, there have been long periods of low-level violence, punctuated by brief, intense bouts of killing. Violence does drop significantly outside extreme periods of war or uprising. But it does not stop. On both sides, the numbers add up to painful personal losses and leave deep scars. For every death, on either side, there is media coverage. Funerals are often attended not only by loved ones, but also by strangers offering sympathy and solidarity. Israelis might mark the spot of an attack with a commemorative plaque or stone. Palestinians frequently plaster the area with posters of those killed, who they call "martyrs." Palestinian political scientist Mohammed Dajani says the never-ending violence carries an element of revenge that keeps the conflict going. "It is this feeling of hatred for the other. This feeling of enmity for the other. From time to time, it will spill over and destroy lives and property," Dajani says. Dajani, who has taught Palestinian students about the Holocaust, blames politicians, including the top leaders on both sides, for exploiting those losses, promoting fear and more violence. But it's a complex fear, says Israeli political psychologist Gilad Hirschberger. He researches the impact the fear of death has on group identity and politics. Repeated exposure to killing makes people constantly aware of their own mortality, Hirschberger says. So they seek survival through association with something that seems larger than an individual — that is, their collective groups. These are often based on religious, cultural or national identity. That means differences with other groups take on enormous importance, Hirschberger says. Behind fights for territory and security in this conflict, there is a constant, fundamental fear: Will my people survive? "It's no longer a clash between two parties disagree[ing] over concrete issues," Hirschberger says. "There's something very deep going on here." For Jews, this harks back to the Holocaust, and centuries before. For Palestinians, it rationalizes collective resistance to Israel's military occupation and control. American political scientist Dov Waxman of Northeastern University has found that regular violence leads people to doubt the situation will ever change. "They see it as almost an inevitable feature of life," Waxman says. "So that saps the political will, if you like, to try to change the situation." His research has focused on Israelis. But many Palestinians also don't expect the situation will change. In addition to those killed on both sides during lulls in large-scale violence, tens of thousands of others are exposed to incidents that physically injure or traumatize them. "We see trauma and loss like a stone thrown into water," says Sigal Haimov, co-founder of an Israeli victims' help organization. "There are the ripple effects, and they affect every part of society." A year after an Israeli soldier killed her son, Laith, Samira Khaldi feels no happiness. Israeli Chaya Wasserman, whose husband was killed by a Palestinian gunman, has turned to laughter therapy as one way to cope with her grief. Neither woman sees losing her husband or son as routine. But both assume the killing will continue.